Mars Curiosity Rover, aka MSL(Mars Science Laboratory) blasted off from Earth aboard an Atlas V rocket on the morning of November 26, 2011. After an arduous journey of over eight months, Curiosity touched down on the Martian planet on August 5, 2012 on the edge of the Gale Crater. Now, over 2 years and counting, Curiosity continues to "rove" the planet. According to NASA, the Mars Curiosity rover has reached the Red Planet's Mount Sharp, a Mount-Rainier-size mountain at the center of the vast Gale Crater and the rover mission's long-term prime destination. Mars Science Laboratory is a rover that will assess whether Mars ever was, or is still today, an environment able to support microbial life. In other words, its mission is to determine the planet's "habitability." The rover carries the biggest, most advanced suite of instruments for scientific studies ever sent to the Martian surface [NASA]. Among its many instruments though, the one creating the most buzz is by far its Mast Camera. The Mast Camera, or Mastcam for short, will take color images and color video footage of the Martian terrain. The images can be stitched together to create panoramas of the landscape around the rover. Like the cameras on the Mars Exploration Rovers that landed on the red planet in 2004, the Mastcam design consists of two camera systems mounted on a mast extending upward from the Mars Science Laboratory rover deck (body). The Mastcam will be used to study the Martian landscape, rocks, and soils; to view frost and weather phenomena; and to support the driving and sampling operations of the rover[NASA]. Mars enthusiasts, truth seekers, Youtubers, and news sites alike continue to point out strange anomalies (or "Marnomalies") seen in the raw images sent back by Curiosity's MastCam. People are seeing more than just piles of rocks. The anomalies being highlighted are as diverse as those pointing them out and the list of things people are seeing include but are not limited to, machines, statues, building ruins, skulls, animals, humanoids, plants, and intentional doctoring of the images. For instance, rt.com posted an article about the so called traffic light and perfect sphere seen on Sol 753 and 746 and examiner.com posted an article about similar elongated heads seen by the Mars Pathfinder rover and the Curiosity Rover. Some enthusiasts create entire websites and Youtube channels almost entirely dedicated to anomaly hunting. One such site is whatsupinthesky.com run by Will Farrar. His collection of Mars anomaly Youtube videos is quite extensive and possibly the largest out there to date. One of his more detailed examinations is called the Rocknest Special Report and consist of a 4 part video serious where he scores over a panorama taken by Curiosity while the rover was working at a site called "Rocknest" in October and November of 2012. Anyone can become an anomaly hunter. All you need is a computer and an interent connection and maybe a little imagination! A quick visit to the JPL MSL raw image website and or the JPL Photojournal site and you can download and begin looking at the raw images yourself. CivRadio has recently done a little hunting of its own and found some of its own Marnomalies. 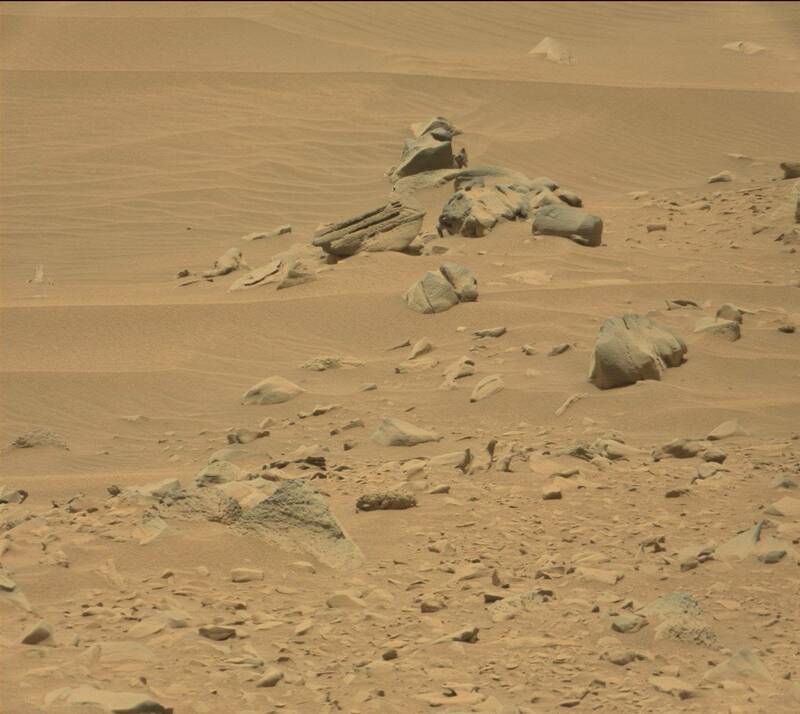 We chose to look at 3 different Curiosity Rover Mastcam images from Sol 735. The first picture of interest is 0735MR0031500320403107E01_DXXX.jpg and we titled this image "The Lion, the Witch and the Kitchen Sink" or some of us are calling it "Everything Including the Kitchen Sink". On the left side of the image, notice the squared object with a domed bottom that looks like, well, a kitchen sink! Notice the right angles and parallel lines and beveled edges on this object. If it's nothing but a rock, then it's quite an interesting rock. Next, just to the right of "The Kitchen Sink" we see an odd pile of rocks that seems to resemble a lion or a cow laying on its side complete with two eyes, possibly two ears and a snout and curious groove marks that could be teeth or nostrils. Directly above "The Lion" is what looks to be an animal or humanoid figure poking out from behind a boulder. While to some this anomaly looks like Yoda from Star Wars, we have termed it "The Witch". Our next picture of interest is 0735MR0031500030403078E01_DXXX.jpg. This anomaly found in this image is what we are calling "The Backbone of Mars" or "The Tooth". Notice the curved pointed and thin edges of the object. It really looks like a fossilized spinal column or tooth or a hunk of fossilized scrap metal. 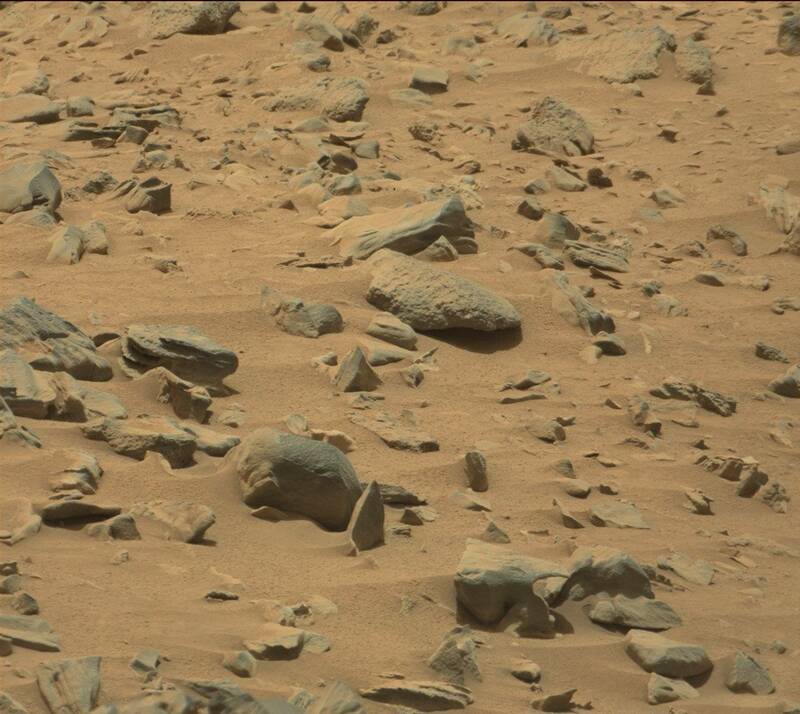 How often do you find rocks that look like this here on Earth? It would be nice if we had an image of this same object from a different angle. This anomaly would be a great place to test out that wonderful suite of instruments Curiosity is carrying. Our 3rd image of interest is 0735MR0031500020403077E01_DXXX.jpg. This Marnomaly is being called "The Claw", or "The Wave". Surfs up indeed! Just what are we seeing in this image? It looks like a sculpture of a crashing wave in the ocean. Is this molten rock ejected from a volcano that just happened to form a curious wave shape? Or is this the remains of some twisted and melted scrap metal. 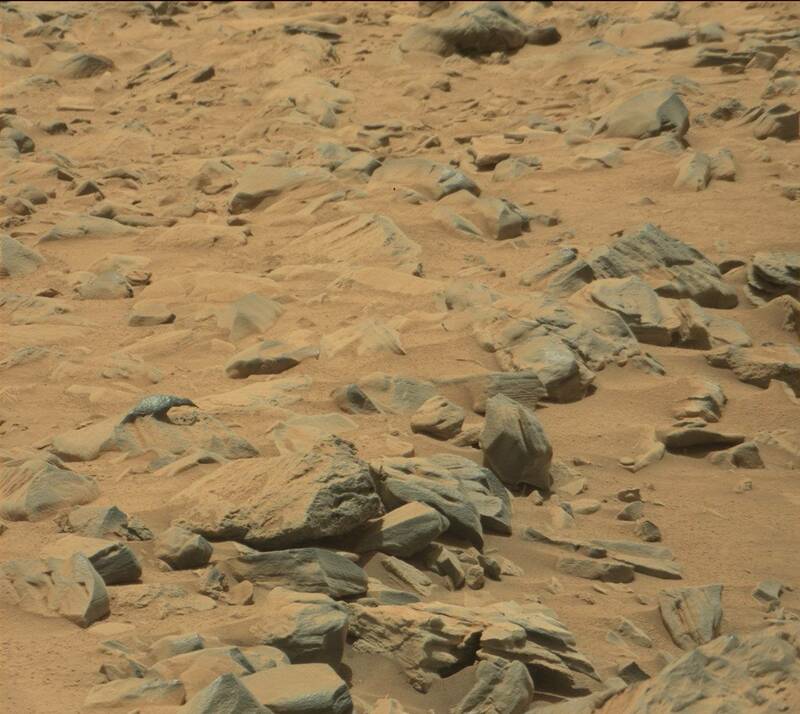 Notice the color of this object is different from the surrounding rocks and seems to be more reflective as if it where metallic. Keep in mind, CivRadio chose a miniscule 3 images from one day of pictures(Sol 735) to analyze. There are over 800 days of images to look at so far to date. And that's just counting the images from the Mastcam. there are several other cameras onboard the rover as well. Sometimes hundreds of images are taken per day by the Curiosity rover. There are so many anomalous looking objects throughout all of raw images, that you could choose a random Sol of the mission and you will almost be guaranteed to find your own Marnomalies. Now, of course all of these anomalies could just be tricks of light and over active imagination. Without more images or data surrounding these "Marnomalies", speculation and imagination are all we have. But, this begs the question, where are the follow up images? If I can see these very interesting objects, then so can JPL and NASA. Out of the hundreds if not thousands of anomalies pointed out, hardly ever do we see multiple images of these anomalies, let alone close ups. NASA might chalk it up to limited mission time and resources. They might be too busy investigating the soil and the rocks for "habitability". But, wouldn't artificially constructed objects on Mars be pretty good evidence for the case of habitability. Also, the rover is nuclear powered and it has a digital camera. Curiosity should have enough time to snap extra photos here and there. I'm sure Curiosity can take as many pictures as it needs to and delete them from memory after they are successfully transmitted back to Earth. So, where are the follow up images? And where is all of the HD video that the Mastcam can take according to its own official overview page?